This book is a 100 percent guarantee that you will get over any person, if the book didn’t work you will be fully refunded your money back. All you have to do is read the book well and apply what’s written in it exactly. If nothing changed I will gladly refund you back. Again I am proudly repeating it, it’s a 100% guarantee that you will recover, not 99 nor 98 or 97. This book is by far the most powerful guide in the world to getting over someone. The book is not just different than other books that tackle the same subject but it’s not even comparable to them. 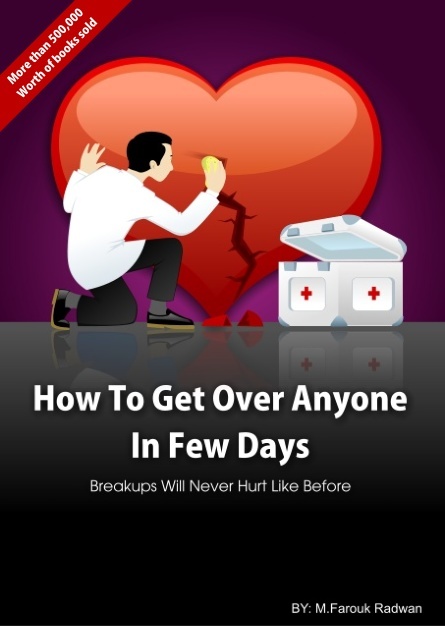 The book will make the worst breakup ever become a simple state that you can recover from in few weeks if not days. Personally I get over the worst breakup ever in three days but this is not how I used to be, I used to feel broken and to stay depressed for months until I grasped extensive knowledge about the psychology of love. This book intends to transfer to you this knowledge that can make you forget about anyone in few days. Even if you were so deeply in love, after reading the book and applying what is in it you will have no emotions towards that person you loved. If you feel that the person you love is your soul mate and that you simply can't get over him/her then after reading this book and applying what’s written in it he/she will become just like a brother or a sister to you. Moreover, breakups will never affect you the same way they used to affect you after reading this book. Few days after applying what’s written you will start to feel better, by the second week you will recover up to 50%, your mood will become more positive and you will start feeling better everyday. The only thing you have to do is to stick to what’s written. The other thing that makes this book different is that it’s a 100% guarantee that you will recover unlike other books that just promise you to feel better. I have helped thousands of people to completely forget about the people they were in love with using the techniques in this book. Again I am repeating it strongly and clearly, it’s a 100% guarantee that you will recover. This book is not about intuitive tricks or logical ideas that can be easily guessed like "be strong", "stop thinking of her" or "focus on other things" but is rather one that is based on complex psychological principles simplified enough to be understood by all. All of the techniques in this book are backed by psychology and scientific research. The techniques in the book are derived from Love psychology, Friendship psychology, Neuro-linguistic programming, subconscious mind programming, Behavioral psychology, Hypnosis, Physiology and scientific research. The other thing that makes the book different is that it has no alternatives, browse the web, search for free tips, grab all the advice you can and as soon as you discover that they aren't working come back and buy it. There are no free alternatives to the information found in this book and that's why i am increasing its price every now and then. Bookmark this page and come back when you are tired of searching. If you think that falling in love should involve suffering, pain, feeling bad or becoming depressed then don’t proceed as the book will permanently change your reaction to breakups. I am not responsible if you never felt bad whenever you broke up with someone or if you become indifferent when it comes to breaking up with someone. Don’t worry, the book won’t affect your ability to love and to be loved but it will just change your beliefs when it comes to breakups. The book has a complete 2 month money back guarantee. Number of pages: 54 Pages that guarantees a 100% recovery. Direct and to the point, no useless pages or out of topic ones, I could have made it 300 pages with the same content but I don’t like to waste your time just to make it appear bigger (just like some authors do). For every book that '2knowmyself' releases, new versions are always released that contain more pages and information. The new versions are always sent free of charge to those who bought the old versions. The Prices of the books usually increase with the release of new versions. Farouk Radwan is the founder of 2knowmyself.com ,the one who wrote all the 2000+ articles found on the website and the author of all 2knwomyself.com's books. Farouk is a motivational speaker and trainer, he is studying psychology since he was 17, in addition he is the owner of the company Empowerment (based in Egypt) which is specialized in delivering personal development courses to individuals and corporations. Farouk is a certified NLP practitioner (American board of NLP), certified hypnosis practitioner (American board of hypnosis) and is holding a diploma in behavior therapy and gestalt therapy. Farouk believes in facts that are backed by scientific research rather than Intuitive tricks that can be easily guessed by anyone. Farouk was interviewed and his work was covered by several Egyptian TV channels and popular newspapers like OTV, MBC, El Youm TV,monowa3at TV, Cairo today, International Herald Tribune and el Ahram newspaper. All transactions pass through clickbank.com (one of the most secure services for online transactions on the web) clickbank will not only make sure that your payment is secured but they will also take extra measures to protect you from any kind of online threats. The security of your order is guaranteed. most powerful books that I have ever come in contact with." "i want to thank you because your book was really helpful, it helped me do what i was unable to do for a month in just 2 days." "Thanks for this book. I’ve taken the time to read through it, and it is has started changing my thoughts and outlook enough for me to feel the need to write and thank you. This, along with your site, is some of the most powerful stuff I have read about accepting and changing one’s self for the better"
"In all of the books I’ve read regarding this issue, I’ve never seen anything so powerful. After reading this book, I don’t think I will ever suffer when breaking up again, and not only that, but now I understand most of the reasons for break-ups." "less than twelve hours passed since my breakup, i am recovering already"
" Your book helped me through endless questions that could have saved me years of anguish had I read your book sooner, your book gave insight to me that other books on the subject gave nothing but untested suggestions . I actually felt physically better as well mentally and emotionally cured of being depressed about an issue , Your book explained things so simply and honestly I now view all the processes of love , finding love , being loved ,and recovering from loosing love through a whole new healthy spectrum . I am so much happier having read your book"
The books are genius. Everyone should read them. "I really thank you for your work and this book. It was very helpful.It's still hard to say I'm finished with this person .Although I understand that's the important step. I will be buying more of your books. Sincerely"
I've been suffering of breaking up for almost a year now.. and I that it was only me..
“you said that those books are weapons, my opinion is that those books are not just weapons, those books are infinite bullets that i can use anytime under any circumstances and any situation to face all other weapons. "Lots of copies sold, no one will ask for a refund :)"